But our time together isn’t over! We’re just getting started! If you’ve been following along with Applied Digital Skills Week and our daily challenges, you’ve accomplished a lot! You created a class, explored the curriculum, experienced the curriculum as a learner, and came up with an idea for remixing an activity for your classroom. You’re ready to enroll your students and get started! We’re wrapping up the week with a few tips and resources that will help you as you start enrolling your students. But first, here’s your last chance to win a $25 USD Amazon Card to help with classroom supplies! It’s simple but it’s the most important step. 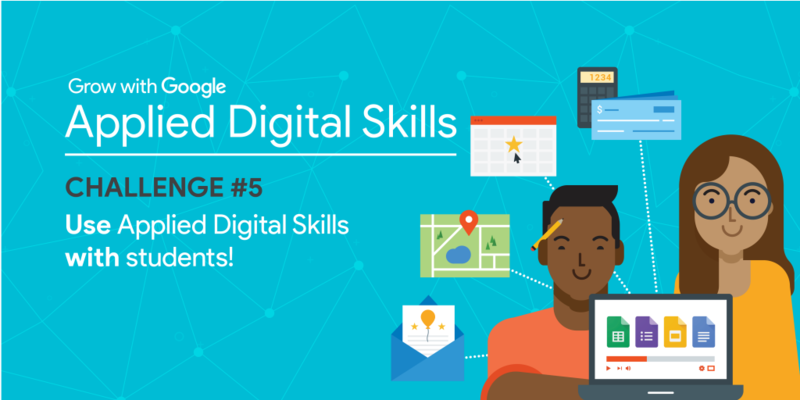 Today’s challenge is to enroll your students and use Applied Digital Skills in your classroom! Can’t do it today? No problem–you can submit your entry any time over the weekend. To enter the final challenge, share the lesson you’re introducing to your classroom, a story, screenshot of student work, photo, or video about your students’ use of Applied Digital Skills. Share on Twitter, Facebook, or Instagram with #GrowWithGoogle and #EdTechTeam. Entries for today’s challenge will be accepted until 11:59 PM PST on Monday, October 15, 2018! We’ll select one winner from today’s challenge to receive a $25 Amazon card* to help with classroom supplies. We’ll direct message you if you’ve won! An invitation for your class to an exclusive YouTube Live with a surprise Googler. WOOT! WOOT! I used Applied Digital Skills with my Students! After creating an Applied Digital Skills class, you receive your class code. When your students log into Google’s Applied Digital Skills, they will choose “I am a student” and enter your class code. TIP: Your students can access the curriculum without signing in. In order to track their progress and see their responses to the activity reflections, they must log in using the steps above. The instructor dashboard is where you can view student progress after your students have accessed your class. To view progress, click on your class and you will see four tabs across the top. Click the Student Progress tab to see a list of your students. By default, the lesson displayed is the If-Then Adventure Stories, but you can click the drop-down menu to look at a different lesson. Here you will see check marks showing videos students have watched. Scroll down on the page to see your students’ answers to the end of activity reflections. You can see combined data and individual responses. Give students a direct link to the lesson you want them to work on using Google Classroom or any method you use to share resources with students. Remember to make sure students are logged in so that you can track their progress! You can track your students’ progress in Applied Digital Skills and they can submit their final projects in Applied Digital Skills, but you can’t see their work in progress docucments. In order to view your student’s work as they go, they need to share their documents with you. Even better, if you use Google Classroom, you can create an assignment in Google Classroom for the lesson. This allows students to create their documents from a Classroom assignment allowing you to view their work as they move along. Who wants this information in Slides format? Me, me, me! These slides include the information above AND MORE including slides you can use to get your students enrolled in a course. Feel free to copy these slides and use with your students. These slides are also useful if you’re leading a workshop for teachers! EdTechTeam email, mini-courses with tips and tricks for integrating the Applied Digital Skills into various subject areas. EdTechTeam is hosting free, half-day Applied Digital Skills workshops in California, Nevada, and Arizona. Eric Curts from Control Alt Achieve wrote this great overview blog post about Applied Digital Skills. Here is a one page PDF about Applied Digital Skills you could share with your school community. WANT TO CONTINUE THE LEARNING? JOIN US AT AN EDTECHTEAM SUMMIT NEAR YOU!